Crossings was commissioned as work in progress by DaDa Festival (Deaf and Disability Arts) Liverpool. An extraordinary team of creatives brought the production together, directed by Karena Johnson with set designed by Chris de Wilde and visuals by Caglar Kimyoncu. The production uses integrated sign language throughout created by Hetty May Bailey, interpreter and BSL consultant. It opened at The Cochrane Theatre in London to full houses in June 09 before transferring to Treasure House Theatre and Bird Theatre, Liverpool. 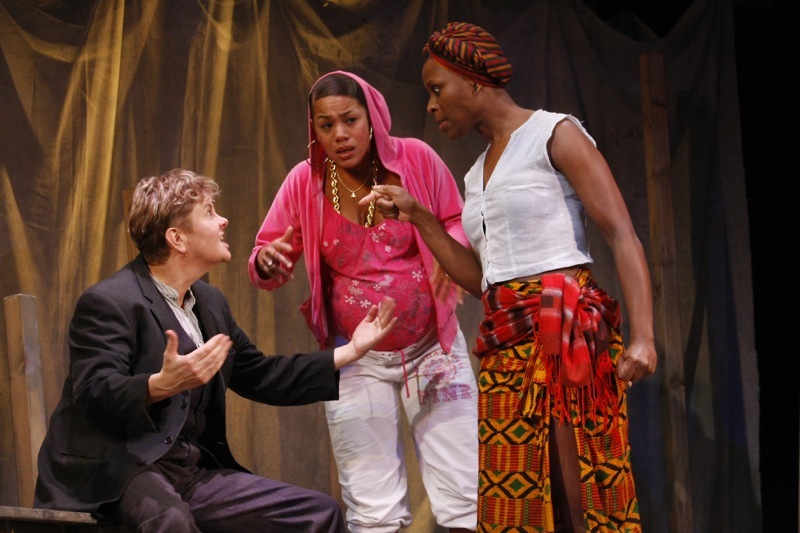 The full production launched RichMix's Identity and Migration season directed by the inimitable Paulette Randall, starring Margo Cargill, Nadine Wild Palmer and Julie McNamara. Crossings was one of the hottest theatre tickets at the Decibel showcase in Manchester and went on to tour throughout the UK. Shelley is 15, pregnant and she wants to get out of the gang. But you don't do that, do you? In a raging storm one night, she finds shelter on an old ferry boat. But this is no ordinary boat, this is the ghost of the Zong, a slave ship with a murderous history. Confronted by two powerful voices on board Shelley finds herself questioning everything she holds dear and is forced to fight for her future. Who are these ghostly visitors? Are they for or against her and will she ever get out of this alive? Heggarty confronts Nzingah as a panic stricken Shelley tries to intervene. 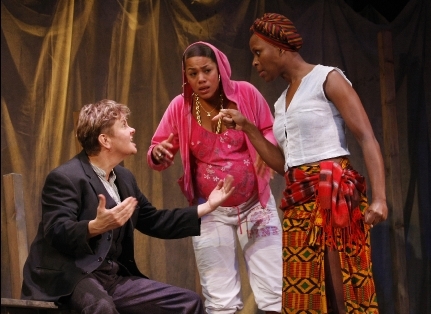 Pictured: Margo Cargill as Nzingah and Nadine Wild Palmer as Shelley.